Beauty, serenity, and comfort await you in the South Penthouse. Indulge in luxurious penthouse living in the heart and soul of New Orleans’ beloved French Quarter. This historic building has been masterfully renovated to incorporate modern elegance and comfort, while maintaining its Old World charm. The South Penthouse is ideal for groups of 6-8 guests. The penthouse offers two sumptuous master suites, both boasting king-sized iComfort beds and lavish en suite bathrooms, 1 half bath, and a fully appointed kitchen with adjoining dining and great room. Fine contemporary décor and touches of New Orleans complement the gleaming hardwood floors, granite countertops, exposed brick walls and vaulted ceilings. Come stay at the Penthouses at Iberville Gardens, where you’re two blocks from Bourbon St., two blocks from the House of Blues, and exactly where you want to be. Your penthouse is located in the French Quarter, just minutes away from the Superdome and the Ernest N. Morial Convention Center. Whether you’d prefer to walk, jump on a historic streetcar, or take a taxi, Uber or Lyft, you’ll find yourself perfectly situated to get anywhere in the city. There's no need to travel anywhere, however, as good times abound in the French Quarter. You can enjoy the festivities knowing you can be back in the comfort of your penthouse in mere steps, relaxing with a glass of wine on the balcony or watching one of the three 4K HD TVs. However you plan to enjoy the Big Easy, your penthouse will serve as the perfect headquarters. Whether you’re coming to New Orleans for Mardi Gras, a special event, or just to experience the French Quarter and the Big Easy with friends and family, there are no better accommodations than the Penthouses at Iberville Gardens. The South Penthouse will provide the comforts of home, the luxury you deserve, and the location of your dreams. Our Penthouses also offer a unique opportunity for large groups: book both the South Penthouse and adjoining North Penthouse for an unforgettable stay for up to 16 guests. For assistance securing your reservation, contact owners Alex and Tony. Come experience the best of New Orleans living and laissez les bons temps rouler! ARE YOUR BOOKING DATES NOT AVAILABLE AT THE SOUTH PENTHOUSE? Please see our other Platinum Properties - The North Penthouse at Listing # 888314, Le Château de Pauger at Listing # 455369, La Belle Cajolée at Listing # 890513. Take note of the glowing reviews and hear what kind of stay awaits you! Alex and Tony are renowned for their hospitality, and their meticulous attention to detail results in an unforgettable experience. If you have any questions or need assistance completing your reservation, please call (888) 980-5663. For more information about the amenities this property provides, please see the “Unique Benefits” section below. Below, you will find exclusive details pertaining to the Penthouses Location - Your penthouse is located in the heart and soul of New Orleans – Enjoy the French Quarter without any hassle. Groceries and Stocked Items - A variety of amenities will await you and your party. There are several coffee makers (varied in design and function), complimentary snacks, local brewed beverages and more. Washer and Dryer - The Penthouse has a washer and dryer as well as other miscellaneous cleaning supplies. Please feel free to wash and dry your clothing during your stay. Laundry detergent, softener, iron/ironing board, and more - all available to you. Sleeping Arrangements - Comfortable sleeping arrangements are provided for up to 8 guests. Each master suite boasts a king-sized bed with iComfort mattress. The grand living room provides a third resting place with a comfortable sleeper sofa. Groups of 8 can make use of the innovative Jaxx sleeper for a fourth sleeping option. Bedding for all guests is always provided. Private Balcony Kick up your feet, pour a glass of wine, and relax on your private balcony overlooking the lush courtyard below. On many a night, the seductive tempo of blues saturates the air from the nearby House of Blues. Technology The living room and bedrooms are all outfitted with 4K HD TVs for your enjoyment. Stay connected during your stay with free WiFi inside and out. 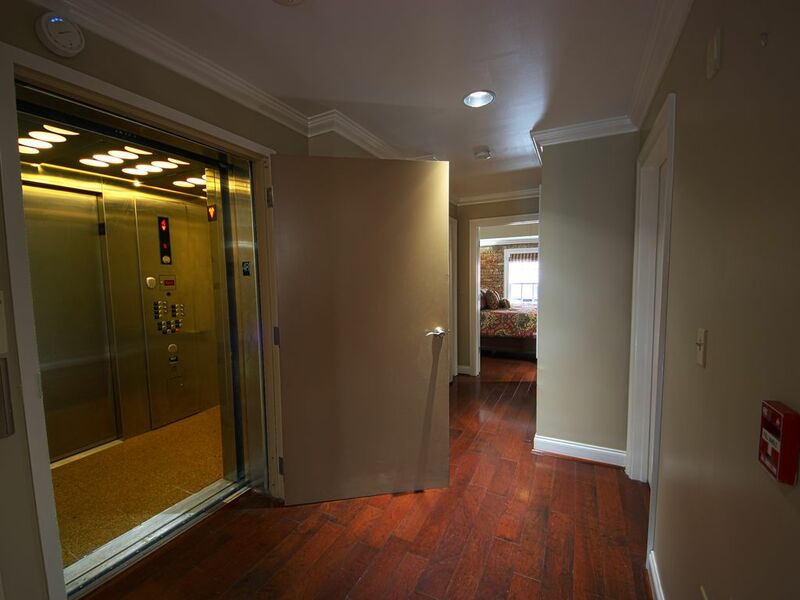 Access to your penthouse is provided through digital keyless entry, including your own code to the private elevator that takes you directly to your penthouse. Smoking is permitted only when on balcony. Beautiful place. We had 6 women staying for a 10 year anniversary of Mardi Gras. We had plenty of room. Location was great - walking distance to many sites. A great space, perfect for our group! This is a great space, and was perfect for our group! We came down to celebrate a friend's birthday just before the Mardi Gras festivities began. We were greeted with a cake and great accessories, along with the soft sound of jazz floating up from the House of Blues when we stepped onto the balcony. I would definitely stay here again the next time I'm back in New Orleans. The host is fantastic and was accommodating, nice, and very easy to work with. 10 out of 10. We stayed here for a New Years weekend with our son. It was a perfect location in the French quarter. Within walking distance to everything and even close enough to walk to some places on the other side of canal st. It was clean. Alex was a pleasure to work with. The frig was stocked withstand nice Abita beer selection. There was also a nice selection of Kuerig coffee pods. The place was very clean and tastefully decorated. We would definitely stay here again. Beautifully renovated penthouse! Very clean, large, private, and well appointed. On a less busy street but in a perfect location: walkable to everything above and below Canal Street. Great location and comfortable home base in French Quarter! Our family of eight had a great time spending Thanksgiving here. The penthouse is located close to the trolley line and a few blocks from Royal and Bourbon, which are good! Alek's recommendations were great and he is willing to help in any way. The place fit 8 people but we were a bit squished at meals and bedtime. Don’t wait!! Book now!!! We had a fantastic girls trip with 6 of us ladies. The house was HUGE!!!! Big enough to spread out! The balcony facing the house of blues is huge! The house had every imaginable comfort! Plus the extras were awesome, we had a great doberge cake waiting for us as well as a variety of local adult beverages, a great treat! Plenty of bedding and towels. I would book this place again in a heart beat! Please note that there is special pricing for seasonal/special events. Seasonal/special events include, but are not limited to: Mardi Gras; New Orleans Jazz and Heritage Festival; French Quarter Fest; Essence Festival; and the Voodoo Music and Arts Experience. Therefore, final pricing for these periods will be higher than the instant booking quote so please contact us for full disclosure of the applicable rate. Consequently, instant bookings at the standard published rate will be subject to payment of an additional sum before the booking is accepted. We REQUIRE purchase of the $99 Property Damage Protection Policy. WE DO NOT ACCEPT ANY OTHER FORM OF DAMAGE DEPOSIT, NEITHER CASH NOR CREDIT CARD. If you pay the $5000.00 deposit in cash or credit card you will be subject to service fees and/or credit card fees which will result in a return deposit of less than $4700.00 even if there is no deduction for any damage to the property. Any damage to the property will result in further reduction to the return deposit. Although it has been our experience that it is a rare circumstance when it is necessary for our guests to cancel their reservation, we encourage our guests to consider purchase of the travel protection policy because we have a no refund cancellation policy.